In the early days of LCD TV Sharp came out with a strong product line and established a reputation for quality. With new brands of LCD TVs popping up on store shelves everyday, Sharp hasn’t been able to rest on its laurels. Today Sharp continues to prove that it is up for tough competition and remains a revered manufacturer of LCD TV. With a comprehensive line of quality LCD TVs for any installation or budget, Sharp continues to dominate the LCD TV market. The LC-20B8U-S and LC-20B9U are 20-inch TVs in Sharp's high-end AQUOS lineup. Buyers of Sharp's AQUOS TVs are looking for the best picture money can buy delivered in stylish form. Bargain shoppers don't flock to the AQUOS line looking for a deal, but with LCD prices falling, either of Sharp's top-end 20-inch TVs can be had surprisingly cheaply. Both models feature a 4:3 LCD panel surrounded by a black frame with wide black speakers along the sides of the TV. The speakers and TV are then capped off with a colored plastic strip along the top and the bottom. The outer strip is silver on the LC-20B8U-S and titanium on the LC-20B9U. Sharp's titanium looks like a slightly bronzed version of silver. The wide speakers on the sides of the 20-inch AQUOS TVs make the televisions’ overall shape follow that of a 16:9 rectangle. The LC-20B8U-S and LC-20B9U models share identical electronics and construction. We reviewed a LC-20B8U-S, but our evaluation covers the operation and performance of both models. I was impressed with the LC-20B8U-S’s all-around excellent performance watching test videos from the Ultimate DVD. Color was simply astounding on the LCD TV. TV manufacturers have long been able to make bright reds and vivid blues, but what impressed me about the LX-20B8U-S was the quality of non-primary colors. As a reviewer I rarely mention purples or browns when reviewing an LCD TV and it's because I rarely see them in true form. The LX-20B8U-S treated me to earthy browns — cheap LCDs display brown as gray. The vibrancy and hue of purple graphics on screen matched the colors you’d find picking wildflowers. Rarely do manufacturers go the extra mile to ensure such quality color performance with smaller LCDs. The LC-20B8U-S is a rare mix of compact size and rich, realistic color. To get the accurate color, dark blacks, and good white balance we enjoyed, a few picture adjustments were needed. The LC-20B8U-S arrives set at its least accurate setting, dynamic. Standard, movie, and game all provide a more realistic picture, with movie being our preferred starting point for fine picture adjustments. We found manually adjusting the color temperature was necessary to achieve good overall white balance. Drastically curbing the blue channel level and nudging down the red channel brought our whites inline. Turning backlight to the normal setting, the mid point on the TV's 1-17 scale, we had a bright picture. A standout feature of the AQUOS line of TVs is OPC, which automatically adjusts the bulb's brightness level based on ambient light levels around the TV, giving users an optimal picture and preserving the brilliance of their TV for years to come. In any room with windows the benefits of Sharp's OPC can't be understated. The TV's florescent bulb is scheduled to last for 60,000 hours at the lowest brightness setting. At normal brightness the TV's bulb should last 30,000 hours, which is enough for four hours of viewing every day for more than 20 years. As would be expected for an LCD, bright scenes are displayed with detail and brilliance. 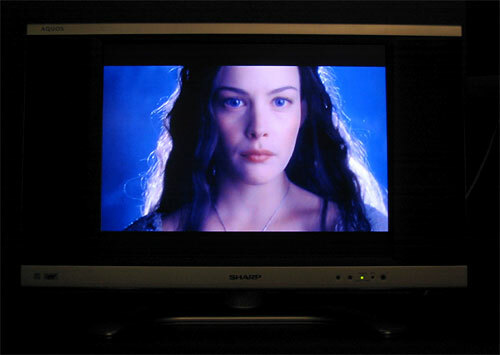 Dark performance on the Sharp AQUOS LC-20B8U-S is superb for an LCD TV. Watching a video clip of white-water rafters, we were able see crisp detail in white caps on rapids and also texture in the dark, recessed parts of rocky canyon walls. The TV has a 500:1 contrast ratio. Fast action is great on the LC-20B8U-S. A herd of stampeding zebras posed no problem for the LC-20B8U-S's de-interlacer. Sharp lists response time as "less than 16ms." We didn't see any streaking or lag on the display that we often see on lesser-quality LCDs. The LC-20B8U-S's tightly packed pixels ensure a crisp picture. The TV's small size means that even high-quality 480i inputs will look well defined on the TV's 1024x768 panel. Pumping up the input to 1080i results with incredible image precision. At the opening of Terminator 2, Judgment Day we could see precise detail in Arnold Schwarzenegger’s dark hair and eyebrows that wouldn't make it into a non-HD transfer of the movie. 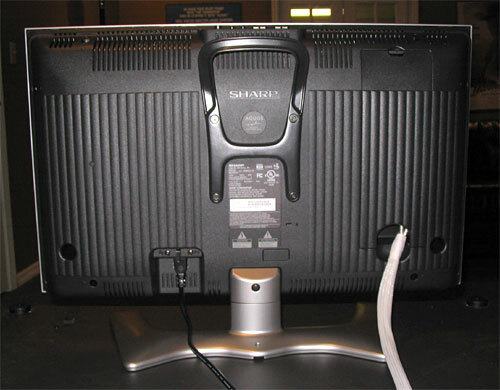 With a VGA input the 20-inch 1024x768 LCD screen displays computer source well. Web pages and Excel spreadsheets were clearly visible at default font sizes a few feet back from the TV, making this LCD a great tool for sharing documents or presentations at a small conference table. Though our computer detected 640x480 and 800x600 settings, we couldn't get them to display. Since the TV's 4:3 aspect ratio matches that of a standard computer display there is no image distortion. 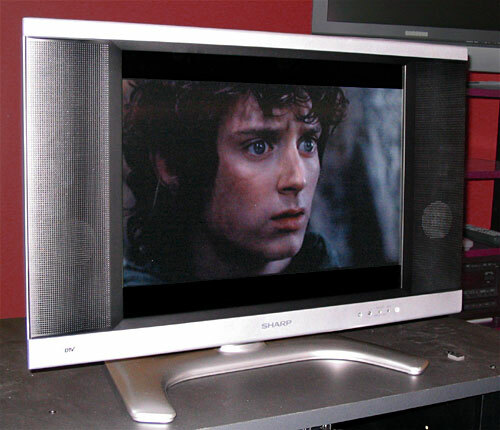 The TV isn't ideal as a desktop monitor for tasks like word-processing and web surfing because of its large size and low resolution relative to dedicated computer monitors. The TV's native resolution is an asset though to PC-gamers, whose games run at 1024x768, well below high native resolutions of 20-inch LCD displays. If you play video games that run at 1024x768, you should consider the AQUOS LC-20B8U-S as a gaming monitor. It has a better response time than Sharp's 20-inch LCD computer monitor, costs hundreds less, plus you get an HDTV. The Sharp AQUOS LC-20B9U and AQUOS LC-20B9U have full-feature sets for their compact size. The 20-inch LCDs come with a great collection of inputs, sound, and convenience features. Like all 20-inch LCD's we've encountered, the LCD TVs do not include an ATSC tuner, CableCARD slot, or picture-in-picture functionality. On startup users enter their preferred language and cable connection type and the TV completes its EZ-SETUP. The auto-programming finishes quickly but users should choose to enter the time manually, opting out of the painfully slow auto-time setting feature. The Sharp LC-20B8U-S's drop-down menu system is a breeze to use. The menu font is easily readable at a ten-foot setback. Sharp has figured out what some mid-sized LCD TV manufacturers haven't: there's no point to having a remote control if you have to walk to the TV to be able to read what settings you are changing. The LC-20B9U's remote control is shaped like a putty knife. In an era of generic remotes, the LC-20B9U's remote design is refreshing. Rubberized grips along the side make it easy to hold and its buttons provide good tactile feedback. Layout is straightforward. Sound via the built-in speakers comfortably filled an area 15-feet by 15-feet. Quality is good but don’t expect floor-shaking bass out of the 20-inch TV. The LC-20B8U-S includes an impressive host of inputs for 20-inch TV. The LC-20B8U-S includes an impressive host of inputs for 20-inch TV. There are two sets of component inputs that support 480i through 1080i sources (some component jacks only support 480i). A third input supports composite input via RCA and S-video jacks and a fourth jack supports composite via RCA. 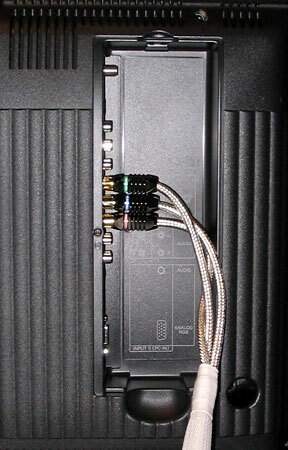 A VGA jack and coaxial jack round out the input connections. There's no pure digital connection, but all DVI or HDMI capable devices on the market look great over tried-and-true (and cost-effective) composite or VGA connections. Power consumption is miserly at 81 watts and heat output is proportionally low. The Sharp AQUOS LC-20B8U-S and AQUOS LC-20B9U are assembled in Mexico – presumable of Japanese made parts. The television itself is about 3.5 inches deep. Thanks to an easy-to-access nested input bay you’ll only need to allow about 1/4 of an inch off the back for cable routing. The input bay also has a plastic cover to keep cables concealed. With the stand the LCD TVs are 25.25 inches wide, 17.5 inches tall, and 9.6 inches deep. At just under 27 lbs. the TV is easy to move. The 20-inch LC-20B8U-S and LC-20B9U are great LCD TVs for a bedroom, kitchen, or dorm. They would also go great in a cabin, boat, or motor home. HDTV, plentiful component inputs, a VGA computer input, great sound, and Sharp's auto-brightness OPC functionality make them some of the best LCDs available. The AQUOS LC-20B8U-S and LC-20B9U are some of the most feature-packed 20-inch LCDs on the market. Their $800 price tag means they’re value-packed too. With excellent features and class-leading picture quality the LC-20B8U-S and LC-20B9U can't be overlooked.